​magic is a harsh master. 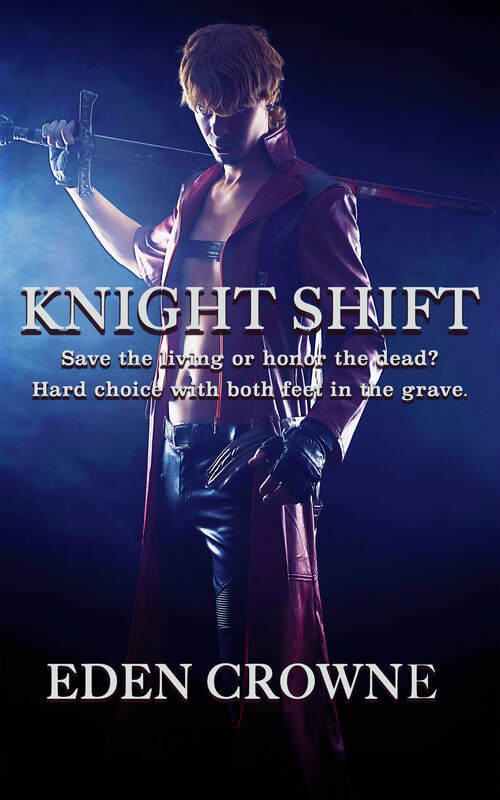 Knight Shift is a novel of cruel and unusual magic. A fast-moving contemporary dark fantasy of East and West, Mortal World and Faerie, where often the only choices left are bad ones. For two thousand years Killian the Soulless has stalked the spirit who murdered him and burned his family alive on the shores of the Irish Sea. Trading his soul for a second chance, Killian serves as a Knight of the Divine Death. A warrior bound for eternity to the great Daemon Council appointed by their one God to oversee the ordering of the Multiverse. Killian, however, is interested in only one soul. And he has no intention of saving it. When a searing blast of wild portal energy announces the Council’s enemies have declared war on the tenuous balance between the hidden worlds, Killian learns vengeance is finally within reach. Too bad our world must burn for him to get it. Funny things demons. Well, not in a “ha-ha” sort of way, but as an infinitely varied form of life. They were the most physically and supernaturally diverse of all the races of the Hidden Worlds. No one knew if they started out in just one plane of existence and spread, like cockroaches, or evolved, each species in its own realm. What was the demon genome? That would be interesting to know, I thought as I watched a pair of brutish Japanese Oni demons walk into a pachinko pinball parlor. Hiding in plain sight, concealed beneath the human visage of a glamour spell. The pachinko place sat squarely between a McDonald’s and a Chinese noodle shop in front of a train station, not far from the center of Tokyo. I picked up their trail in the back streets of the crowded Shibuya entertainment district, their scent snaking in and out of fashionable groups of boys and girls admiring themselves in shop windows. The scent led to a hundred-yen-a-plate sushi place where the Oni sat, stuffing themselves with rice and fish. From there, they hopped a cab to a massage parlor, the kind where massages centered on a few strategic inches of the male anatomy. The Oni then proceeded to eat and drink their way through the late afternoon and evening until I could only marvel at the scope of their appetites, finally ending up here. Generally, those who serve the Daemon Council tread carefully in Japan. This country was claimed by the disparate clans of the supernatural Yokai. Yokai legends, tales, and sightings were still very much a part of Japanese life even in these sophisticated times. And so they should be. The border between Yokai and Japan was far more porous than any other Hidden World. The relationship between the Council and the Yokai, including the Oni, was a singular and strange situation. Demons ranked low on the supernatural food chain. Sentient, though it is surprising how much stupidity sentient can encompass, most were not blessed with the highest order of intelligence. The Oni of the Yokai were different. They were not exactly demons. Nor were they Daemon, Faerie, or Elf, and far from mortal. The Yokai world was a vast crazy quilt of fiefs and small kingdoms, often at war with each other, though united in their disdain for the Great Balance. Their homelands lay behind barriers few from other realms dared to cross. The location, like its people, neither Daemon, Faerie, nor mortal. A Hidden World indeed. However, many of the Yokai chose to live in the mortal world, their ties not always inimical. My masters, the Daemon, believe they alone have a mandate from their almighty, one heavenly God to keep the Multiverse in order. Daemon like the worlds divided into nice, neat categories. The Yokai's insistence on integration with human life, coupled with an unwillingness to preserve the Balance against the forces of Chaos, or indeed, choosing to work actively against us, made it easy to declare them outcasts. All Yokai are classified – even those who are not Oni – as demons, and therefore, not equal under the law. At least as applied by the Council of Daemon. It was a slight that went neither unchallenged nor unnoticed. The train station steps provided a clear view of the pachinko parlor. At this late hour, the city buses usually lined up in front of a busy transportation hub like this were shuttling, dark and empty, back to the garage. Beyond the diesel fumes from the buses, the air smelled of rain. The demons would probably be awhile. Luckily, Starbucks was still open. I stepped quickly into the coffee shop, smiling easily at the counter girls, who smiled back. Picking up a double espresso and several sandwiches, I settled myself at the top of the broad steps leading down to street level to wait and watch for the Oni to tire of pinball. Being a Knight Divinus Mortem was not the glamorous adventure it might appear to the newly deceased, I thought as I sipped my bitter coffee. Though it certainly seems like a good idea at the time, after being murdered or sacrificed by priests, soldiers, or bands of roving barbarians. They brought me back from the dead with a Reanimator Pearl in the hands of a shining and powerful Daemon lord. Presenting me with the dazzling offer to become an immortal demigod and kill for peace. Just pledge your soul and live the adventure: awesome supernatural powers, travel across the realms, eternal youth! Your Multiverse needs you to preserve the Balance of the Worlds. I always wondered how many warriors turned such a proposition down. Soul or no soul, transformation into a flesh and blood demigod is a rather spectacular offer – especially given the alternative. So, pledge I did. Of course, they neglect to mention the part about plunging a knife into your chest and inserting a Soulreaver crystal binding you to eternal servitude. That comes as a bit of a surprise. I had my own reasons for accepting their offer to transcend to divine knighthood. Reasons haunting me still. The wind was growing stronger, blowing in an autumn storm. Something big was coming, and not just a change in the weather. Big and bad. Several Japanese salarymen, full of camaraderie, beer, and whiskey, though not necessarily in that order, joined me as I waited. They sat on the steps, smoking and attempting to carry on a conversation. It was slow going, their English way below their blood alcohol level by this point. We managed to establish they were from Japan and I was not. They were quite pleased to get their point across. “You are pretty,” said the one with glasses and a comb-over. The long hair kept blowing in the breeze to stand straight-up like a cockscomb on the top of his head. “Pretty man. You are pretty man.” He mimed my hair, then spread his fingers wide around his dark eyes to mimic, I guessed, my blue ones. “Thank you.” What else could I say? I was good looking in a boyish way; never having had the chance to mature into anything else. “Um, what, ano, ano, what are you doing?” asked the other salaryman, one with more hair and no glasses. He was wearing his tie wrapped around his head like a headband, and occasionally made whooping sounds like an American Indian. It must have been quite a party. Standing, I executed a formal bow, my hair sweeping forward and back. I ended with a high, quick, back-flip and a finishing pose. Delighted, the salaryman clapped and shouted, “Yay! Yay!” Not understanding one word. Which was for the best. The part about death was all too true. If they knew how close chaos was at this moment, they'd run screaming down those steps and off into the chilly Tokyo night. I knew I wanted to. Three days ago I was in Scotland, racing a black spell beneath the full moon, breathlessly trance-jumping, a heartbeat ahead of the Magik. I would have made it, but for the standing stones. The “Hill O’ Many Stanes” the locals called it. They answered to other names in the past. Rousing them from sleep, the Magik telegraphed the spell from stone to stone, passing me at speeds even I could not match. It caught me up and I tumbled over and over to land hard in the dirt, tasting blood. Blinking my vision back into focus, I looked up. What the spell was, I had no idea. The bloody thing had shot out of an ancient barrow we suspected of being a dark gate. Obviously suspected correctly. A column of light, sharp-edged and hard, cut into the sky, screaming. Dirt exploded from the surging energy, falling back in a shower of stones, grass, and soil. Dark Magik clawed at the earth, forcing open a doorway into the mortal realm. There was a Portal to the Hidden Worlds at the far end of this stony path. An ancient one, long buried and forgotten. This was not normal, even in the twisted logic of my experience. Portals – old or not – cannot be forced open. They just can't. You either have the keys or runes or whatever, or the Portal remains closed. An Erlking goblin, his massive body completely covered in chain mail, pulled himself up and over to stand at the edge of the earthen crater. The tusks, piercing both upper and lower lips, stretched the goblin’s face into a wide, horrifying semblance of a smile. This was not normal either. Demons were plentiful in the mortal world but fell beasts, goblins and their like, seldom made it through a Portal. Snapping a long, metal whip in one hand and brandishing an iron staff in the other, he strode onto the field, bellowing. His battle cry, as near as I could understand, his speech being badly distorted, consisted of “death” and “dismemberment” chanted over and over. Why he expected to confront an army, I could not guess. I said nothing, watching him. He glared at me; then, realizing I really was alone, doubled over in laughter. I will be the first to admit I am not the most imposing warrior on any given battlefield. Only a young man at the sacrifice that took my life, I have not aged since. Nearly beardless, spare and leanly muscled, my pale eyes, high cheekbones, and soft mouth give me, I know, a slightly girlish air. Yet after two thousand years, I am much more than what I appear. With a crack, the whip snapped at my feet. My attention had wandered from my companions. The drunken salarymen gave me happy smiles and took long drags from their cigarettes. I laughed. I hated sushi. It was the Erlking who brought me through Portals and more mundane forms of transport to Tokyo. In my pocket was a small, carved ivory pendant of a Japanese demon, crouched and snarling. The Erlking was wearing it. This was not a good development. Japanese Oni are bigger and heavier than the pods of Dark Magik demons I usually fought. The two finally exiting the pachinko parlor easily outweighed me by sixty pounds. They were dressed in glossy, oversized tracksuits and enough gold chains to weigh down a body in Tokyo Bay. One had orange hair standing straight up several inches; the other no hair at all. They were talking loudly. People leaving the station detoured around them, taking the pair for cheap gangster muscle. Orange Hair patted his pockets, pulling out an empty cigarette packet and tossing it onto the street. Turning to a cigarette vending machine next to the pinball parlor, he looked up and saw me. As I intended him to. Bidding farewell to my salarymen companions, who were sad to see me go and waved goodbye enthusiastically, I made my way slowly down the steps. Snarling, Orange Hair grabbed a fistful of the other’s track suit and jerked him around. Magik recognizes Magik. They stood their ground as I crossed the street, dodging taxis. Looking through the human glamour they rather inexpertly pulled over themselves, I could see several daggers plus a mace and chain tucked into the bald one’s belt. They growled and snarled phrases at me in the rough Oni tongue. I shook my head; I did not speak Oni. His companion contorted his face into a series of hideous grimaces that looked anything but truce-like. Long ago, the Yokai and the Daemon Council passed beyond being disagreeable to each other and into all-out war. During the war, the Oni and their allies from the Lords of Misrule tried to grab lands in Faerie. Rather a strategic mistake. No one messes with Faeries. In the end, all sides brokered a shaky truce. It was looking a little shakier than usual right now. The wind had finally brought the storm and with a crack of thunder, the rain began to pour down. It was all suitably dramatic. “You break truce! You!” Orange Hair persisted, jabbing a finger at me. Blurring the glamour around myself so only they would see, I drew the two swords from the double scabbard strapped beneath my coat. The blades glittered in the flashing neon of the pachinko parlor. The demons turned and ran the opposite way, pushing and shoving people out of their path. I jogged behind, not too close, splashing through the puddles quickly forming on the pavement. They headed straight down the broad boulevard in front of the station, past bars, restaurants, convenience stores -- I counted three in a two-block radius, Japanese love their convenience stores. All the little businesses crowded around the station like a medieval village circling the castle. The wind doubled in force and I could feel the chill of the rain right through my coat. The Oni kept up a fast pace, eventually running under an overhead expressway slicing through this part of the city and into the green museum belt of a nearby residential area. I knew the area passably well. The street was dark at this late hour. Shedding their glamour, the Oni jumped over a tall, wrought-iron fence into a park fronting the expressway. This part of town was well known for an Art Deco museum/garden and a rambling nature study park. Trance-jumping after them, I splashed through the mud and grass. The formal beds of flowering roses soon gave way to a traditional garden with tea pavilion, maple trees, and carp pond. This part of the park was on the grounds of the old, aristocratic estate that stood here when this was still a village called Shirogane, a half day’s walk from the Imperial Palace. Once away from the street, the demons reverted to the Oni’s ground-covering, bounding gate. Jumping over a different wall, this one made of rough cinderblock, we were soon dodging trees in the nature park. The place was left to run wild for the most part, a dense mixture of old-growth pines, cypress, and cherry, all covered in thick underbrush. A few walking paths were the only evidence of man’s incursion. The Oni made so much noise as they fled, it was not difficult to follow. We were closing in on the side of the park bordering, incongruously, an overhead expressway, a different section of the same one we crossed under moments before. It shadowed the forest park, cars buzzing a few meters above the canopy. The Oni stopped running and drew their weapons, judging, no doubt, we were far enough from observation. The creatures of the Yokai world were careful to preserve the facade of normalcy characterizing Japanese society at every level: real and supernatural. I paused, crouching low, waiting for them to make the first move. The bald one threw his mace and chain, hoping to entangle my legs. Instead of springing away, I jumped directly at him. Orange Hair leaped in front, blocking the first of my blows with his dagger. I cut underneath with the other sword, scoring a long slice across his ribs. Baldy brought his dagger forward. I jumped up, somersaulted, and came down directly behind, stabbing him in the back of the thigh. They both shrieked in anger, turning to grab me with their long arms, and tear me with their claws. Bounding away, just out of reach, I let them chase me now. I’d cut both deeply, though not deep enough to disable them. Cursing in the Oni tongue, they followed, crashing through the underbrush, uprooting saplings as they went. The park staff was going to have a hard time coming up with an explanation tomorrow for all the destruction. We were almost to the support wall of the expressway when the two Oni stopped short. A rustling in the undergrowth nearby snapped them around. Their body posture shifted subtly, becoming more confident. There was a smell in the night air, strong and musky. Our Magik and Yokai Magik have their own unique scent signatures. Orange Hair raised his head, sniffed the air, and then grinned. The rustling got closer. A huge, white fox emerged from the underbrush, panting and showing long, white teeth in a wide smile. It was nearly the size of a timber wolf and glowed with a pearly luminescence, bright as moonlight through the torrents of rain. The beast looked at me, eyes huge and scarlet, the color of freshly spilled blood. Snarling, the fox moved in a blur of speed across the clearing. Ears flat against its sleek head, muscles tensed for battle, the beast stood directly in front of me. The change in the faces of the Oni demons as the beast turned on them was almost comical. In a flash, the fox leaped high into the air, flipping effortlessly into a backward somersault. She came down, not as an animal, but a beautiful, white-haired girl, slim and wild. She wore a tightly belted, short, rough-spun cotton kimono with deep sleeves, her legs and feet bare. Pulling a short sword from the scabbard strapped to her back, she sprang snarling onto the nearest demon. The Oni fought fiercely, stabbing at us, heedless of injury. Thrusting her sword all the way through the arm of Orange Hair, she swiftly drew a dagger from her waistband and plunged it to the hilt in his throat. I kept dodging and dancing away from the bald one, occupying him. He twirled the long mace and chain, throwing it at me with a mighty swing. I jumped, grabbed the mace, twisted the chain around the demon’s arms, and then sliced through his calves, severing muscles and tendons. He fell heavily, screaming in pain. Yuki. Her name meant “snow” and she was whiter than a newly fallen drift in whatever form she took. A Fox Spirit, a shapeshifter of the Japanese Yokai world, and my dearest comrade. We found each other more than a millennium before when her clan and my Master joined forces to fight in the Daemon Wars of the Lords of Misrule and Yokai against Faerie. The Yokai were not united in this venture, having their own Balance to maintain, and the conflict soon turned to civil war. Yuki’s clan was less concerned with enforcing the Balance than acquiring some land from one of the Yokai barons in that dark alliance. She and I were still young, cosmically if not chronologically, becoming first battle comrades, then blood oath friends. Uncoiling a thick cord, she fingered two heavy, ornate, bronze arrowheads swinging on each end. Fudo, demon slayers of the Yokai world, sworn to protect human life, used such cords. Powerful binding spells were woven into the fabric of the cord, braided with the flesh of slain mountain demons. She tied the arms of the struggling Oni while I kneeled on its back, the point of my sword pressing hard into his spine. Yuki grasped the ends of the Fudo cord, chanting a series of cold, gray words. The demon screamed high and shrill. Before she could finish the sentence, we were both hit hard. Something picked me up and threw me backwards into the trunk of a tree with bone-jarring force. Instinctively, I brought my swords up, slashing. They met only air. Something unseen was pushing me back against the rough bark, pressing relentlessly into my chest. It was dark here beneath the canopy. With one hand, I warily felt for what was holding me. My fingers sparked and burned as I touched it: a black O-Fuda amulet paper. In its white form, the Japanese Shinto amulet papers are full of supernatural inscriptions against creatures of Dark Magik, a powerful weapon effective across all magical borders. This black version represented the other side of that incantation. The black O-Fuda could not cripple me. I was too powerful, yet its Magik was still strong. A barrier preventing me from going forward. The black amulet hit Yuki squarely on the back, the force of it throwing her into her fox form. Rolling on the ground, scratching and biting, she tried to tear the thing from her fur. Three creatures jumped down from the trees next to the bald demon. The bald Oni was screaming, thrashing madly, trying to free his arms and legs from Yuki’s Fudo cord. Satisfied, temporarily at least, we were no threat, the Saru Oni did not approach us. ‘They’ll free him now,’ I thought to myself. But no; the apes fell upon the other Oni with teeth and claws, ripping the creature apart as the bald demon shrieked repeatedly. Demon or not, it was a bad death. Their faces dripping and red, the three ape demons came forward, facing us. I brought my swords up. Yuki, her fur bristling, growled a warning. We could not be taken so easily. They grinned, the blood on their mouths, thin lips stretching over identical sets of huge canines. Each drew a dagger from a belt around his waist. Staring straight into my eyes, the Saru Oni plunged their daggers to the hilt, each in his own heart. As one, they fell silently to the ground. The black O-Fuda paper fluttered away; the power energizing it draining away with the apes’ blood. Yuki executed another back-flip, reverting to her human form. Carefully, weapons ready, we walked over to the creatures, our feet crunching on the dead leaves blanketing the forest floor. I told her of my adventures in Scotland with the Erlking after he climbed out of the pit around the Portal. Approaching at a trot, the goblin cracked the whip over my head. The strike was close enough to shave a lock of hair right off. I ran along the tops of the rough-hewn rocks, the whip snapping at my feet. The standing stones exploded with each strike. Dropping my sword to hang by its wristband – never discount the value of wristbands on swords – I grabbed the end of the whip on its next pass, riding the return force of the strike directly into the goblin’s path. Letting go, I swung my sword back into my palm to rip a hole deep into his belly before my feet touched the ground. The goblin-made chain mail melted beneath the blade. Nothing could stand up to Dark Elf casting, and my sword was cast by the best. Flipping back over the downward swing of the staff, jumping hard and high, I tried to put some distance between us. Blood poured from the goblin’s wound. It would take much more to stop an Erlking. The goblin laughed even harder than before, spit flying from his misshapen mouth. Running a wide circle around the Erlking, I dropped my sword to swing by its band, grabbing at a jumble of gems in one pocket. The goblin reached out with his iron staff, nearly connecting with my skull, shearing the tops from several of the taller stones. This was going to be called “Hill O’ Just a Few Stones” after tonight, I thought. Finding what I wanted, I popped the gem under my tongue, chanting words of power to encircle it with Magik. The whip snapped again. Though it cut my hand, I grabbed on; and this time, instead of riding it back, I ran with the lash to wind it tightly around the goblin's legs. Entangled, arms flailing, the goblin fought to keep his balance. Narrowly avoiding the wildly swinging staff, I spat the gem into my hand and shoved the crystal inside the gaping wound. Summoning my energy for a trance-jump, I was not fast enough. The goblin hit me such a blow with his staff, it threw me, stunned, to the ground a full thirty feet away. Howling his victory cry of death and dismemberment, the Erlking untangled himself and advanced at a lumbering pace, weighed down by the armor, but cracking the whip until it snapped within inches of my eyes. The monster was almost at my feet when he faltered. I struggled, crab-like, backwards in the damp grass, desperately putting a few more yards between us. He raised his staff, moving with obvious difficulty. I looked at his belly. His eyes followed my gaze. Instead of blood, ice crystals oozed from the wound, the gem within empowered by an ice spell of Faerie. He was freezing from the inside out. An Erlking is afraid of nothing, least of all, his own death. Practically howling with laughter, he looked directly into my eyes. “Soon, all gates will be open, Knight. Your efforts here are meaningless. Chaos will reclaim the mortal world. We will feast on souls and a queen of Dark Magik will reign over the Hidden Worlds.” His eyes turned to ice, glittering in the moonlight. Icicles ringing his tusks, he said no more. The Lords of Misrule were at it again, apparently. Examining the goblin's body, I saw caked in the ice something that made me realize there was far more than the Lords of Misrule usual mischief at work. I smelled it then. Magik was coming thick and fast on the wind. Trying to read the spell, I hesitated a fraction of a second too long and it hit. My master and the Daemon High Council had flung a ferocious counter spell from their shining palace in the Daemon lands. Hurtling across the plain, it shut the Portal forced open by Dark Magik, knocking everything standing in its way to the ground. Including me. For a breath, the world went black. Pulling the Oni pendant out of my pocket, I showed it to her. The pendant was a marker, given by Yokai warlords to vassals of the Hidden Worlds sworn to their banner. We saw many of them back in the war between Faerie and Yokai. She peered at the ivory. The brow arched a little higher. The Tengu were spirits of immense power, some almost human in form, others frighteningly different indeed. Mt. Takao, about an hour from central Tokyo, was an ancient center of Tengu learning and worship. Thousands of Japanese paid homage to the spirits at Takao's famous Tengu shrine on sunny weekends as they climbed the mountains on popular trails and walking paths. They also came to eat warm waffles baked on the spot, stuffed with sweet bean paste and shaped like a Karasu Tengu – the Crow Tengu. “I like Tengu cakes,” she said ominously. With a fox like yip, she took the bag and stuffed one of the cakes into her mouth, smiling around the bean paste. “No, I mean people like you.” She gave me a wicked smile and stuffed the last cake into her mouth, tossing the bag on the ground. Soulreaver crystals had the power to free souls from certain singular individuals. In the hands of the Knights, the souls were set free, out into the world to pursue their next incarnation. The Lords of Misrule used the crystals to trap the souls. Fueled by a terrible alchemy, they transformed the soul’s glorious energy into weapons. “No. Even in the war, the Lords of Misrule never parted with them willingly, and if the Oni took a crystal, it meant only death. Yokai and Daemon magic...” she let the sentence trail. For Yokai, handling Soulreaver crystals was like holding plutonium. Pure poison, though no one knew why. The transcendent energy of souls did not willingly cross certain DNA boundaries. “Magik evolves,” I pointed out. The Fire Pollen flared blue, reducing the three apes' bodies to ash in moments. Yuki scraped up a large portion of ash, stashing it in a pouch she kept in one sleeve. We burned Orange Hair separately. Yuki unwound the bloodied Fudo cord and tied it back around her waist. It left wet, red smears on the white cloth. We dragged what was left of the dead Oni next to the expressway wall. Yuki and I exchanged glances. I began to cover the body; Yuki crouched as though intending to shift it closer. In a blur of speed, she trance-jumped to a thick stand of brush. There was a high-pitched cry and she emerged, dragging someone by the collar. The figure wriggled, but Yuki held tight. In the darkness, it looked like a man in a light green shirt, pants, and matching cap. The uniform of the park caretakers perhaps? Babbling at Yuki in Japanese, he gestured wildly at the burned spot where the bodies had been. The fellow began to cry pitifully. I squatted down and let Yuki have her way with him. She said little as he spoke in a continuous pleading stream, sobbing all the while. She shook him harder. The air around the man shimmered and the “he” changed into a “she” - a middle aged, slightly stocky woman in a housedress and slippers. Yuki cuffed him on the side of the head. The woman disappeared and a construction worker in traditional wide-legged pants and rubber, split-toed shoes appeared. This time, Yuki threw her captive on the ground; and turning suddenly foxish, bit into his neck with her sharp teeth. Trembling visibly, the construction worker shimmered away, revealing, finally, a large, bushy-tailed animal. Her wide jaws stretched around the creature’s furry neck, its belly in the dirt, its paws scrabbling uselessly. Yuki looked at me, her eyes scarlet with anger. I strolled over to the pair. Squatting down, I pointed one sword at the creature’s face. Its large eyes rolled back, showing the whites.